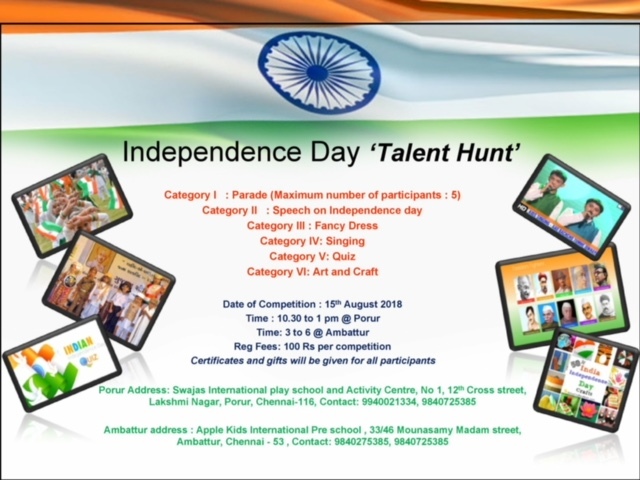 Participate in our Talent hunt and get certificates and gifts for participating in any competition ! Weave your fine skills be it speech ,singing , dancing , parade or fancy dress. Sharpen your memory skills by understanding the importance of our Independence day! We want your kids to come along and have a lot of fun @ Porur or Ambattur. . Call us @9940021334 , 9840275385 or 9840725385 and register with us for a minimum of 100 Rs per competition now! Is there are trophies given for top three??? ?